A tidbit from my cello lesson this week. No, you shouldn't be able to fit the paper under the foot of the bridge. 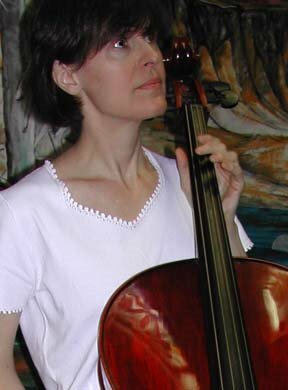 To fix, loosen the pegs slightly, grasp the bridge with both hands, and gently but firmly tip the top of the bridge toward the tail of the cello. Check with the paper to ensure that both feet have good contact with the top, and visually to see that the bridge is straight, then re-tune and check one last time. Consequences of not fixing it? In my case, just a little increased wolfiness. Over time, though, the uneven tension on top can warp the bridge, leading to uneven tuning of fifths (thus even harder to play in tune), and on rare occasion to catastrophic bridge failure. A bridge either breaking or suddenly falling over can damage the top and potentially result in a fallen sound post. Gotta remember to do periodic paper tests during winter peg-popping season. 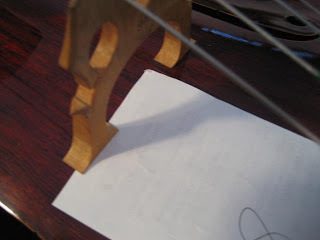 To check my bridge, I position a card (I use a dampits card) vertically, with its bottom edge standing on the face of the cello and one long edge touching the face of the bridge (on the flat side towards the tailpiece); so the top of the card comes up between the strings. I test both feet of the bridge - so the upper face of the card will rest against either the A or C string. This will quickly show whether the bridge is square to the cello. The bridge's feet should have been carved to fit against the cello to maintain the bridge in this perpendicular position. If there are any gaps between the edge of the card and the face of the bridge, I (carefully) make the appropriate adjustment. I also use this card to check the alignment of the front of the bridge's feet to the upper notches in the f-holes on the cello. Realizing that a picture is worth a thousand words, I'll post an example of both alignments in my blog tomorrow. Yes, please. I think I got that, but a picture would confirm.